Over 80 million passengers have flown on the superjumbo in the nine years since it first joined Emirates’ modern fleet. Today, Emirates flies the A380 to over 45 destinations spanning Africa, Asia, Australasia, Europe, the Middle East, and the Americas. Everywhere it operates, the Emirates A380 attracts consumer demand for its industry-leading inflight experience in all cabin classes, and is welcomed by local economies as a contributor to tourism and visitor growth. Sir Tim Clark, President Emirates Airline said: “The A380 has been, and continues to be hugely popular amongst our customers, many of whom deliberately plan their travel so that they can fly on it. But we don’t rest on our laurels and continually invest to enhance our product so as to continue offering our customers the best possible inflight experience. With its inaugural A380 flight in 2008, Emirates introduced several industry firsts including its iconic A380 Onboard Lounge and First Class Shower spa. 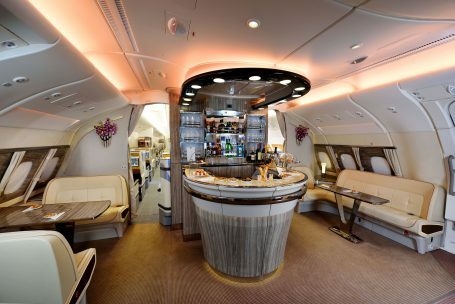 The Onboard Lounge remains one of the biggest draws of the aircraft to date, and is arguably the most popular spot at 40,000 feet. It has gone through several successive and subtle changes, such as the introduction of electric window blinds, before a brand new look was unveiled last July. The latest makeover of the Onboard Lounge, inspired by private yacht cabins, features a more intimate and social area for up to 26 guests. The lounge now has a larger 55 inch LCD screen with surround sound speakers giving customers the latest flight information, or live TV broadcasts of the latest news or sports updates. The First Class Shower spa, catering exclusively for the 14 passengers travelling in Emirates’ First Class private suites, continue to generate as much curiosity and buzz today as when first launched. Since Emirates blazed a trial for the ultimate shower spa experience, only one other commercial airline has offered a similar facility in the sky. With nearly 100 A380s in its fleet, safe to say that if anyone is taking a shower at 40,000 feet, chances are it’s on an Emirates A380. With its many thoughtful design touches including a heated floor, shower timer, a hairdryer, and spa products, Emirates’ Onboard Shower spa remains the standard to beat for inflight luxury. The airline recently introduced sustainable VOYA spa products and exclusively-developed moisturizing pyjamas, allowing customers to arrive at their destination refreshed. Emirates’ award-winning inflight entertainment system, ice, has also been constantly updated to provide customers with more choices for on demand entertainment as well as improvements to the viewing experience. While the equipment has become smaller, media capacity has only expanded and Emirates now provides more than double the entertainment with 2,500 channels of blockbuster movies, TV box sets, music and documentaries. In addition to choice, Emirates has invested close to US $1 billion on hardware to provide a more comfortable viewing experience. Over the years, in-seat screens have been made larger across all classes. The screen in First Class has increased from 27 inches to 32 inches, the screens in Business Class from 17 inches to 20 inches, while screens on the latest A380 aircraft offer the industry’s largest in Economy at 13.3 inches from its original 10 inch screen. Little touches have also been introduced including USB ports for power and data in each seat as well as HDMI ports in premium classes to connect personal devices to the ice screen. The entire A380 fleet has also been fitted with connectivity to allow for free 20mb of Wi-Fi throughout the cabin. In June last year, the first A380 was fitted with Live TV allowing passengers to watch news and sports matches live on board. Since 2008, the efficient A380 aircraft has been further enhanced to operate even longer routes. This had enabled Emirates to add more destinations to its A380 network, including the world’s longest A380 flight – a non-stop Dubai-Auckland service introduced in March 2016. Today, the Emirates A380 reaches all ends of the globe with non-stop flights to Sao Paulo, Casablanca, Copenhagen, Tokyo and Los Angeles from Dubai. Emirates also introduced the world’s first 2-class configured A380 in November 2015, making it the highest-capacity plane in the world with 615 seats on board while retaining the airline’s signature inflight services and comfort.